â€œWater must be purified to ensure that it is clean and fit for human consumption. Water that is not safe to drink can make you sick from a few hours or up to several weeks after taking it,â€ Ona said. Pure clean water must be used for drinking, cooking, brushing teeth, and other activities avoid outbreaks of diarrhea. 1. Prepare a stock solution by dissolving 1 level of powder. Chlorine compounds (65% to 75% available chlorine) to 1 liter of water. 2. Add 2 teaspoons of stock solution to 5 gallons (20 liters) of water. Mix thoroughly and let it stand for atleast 30 minutes before using. Transmission [of leptospirosis] occurs through contact of the skin and mucous membranes with water, damp soil or vegetation (such as sugarcane) or mud contaminated with rodent urine. The occurrence of flooding after heavy rainfall facilitates the spread of the organism due to the proliferation of rodents which shed large amounts of leptospires in their urine. Contrary to common belief, there is no evidence that corpses pose a risk of disease “epidemics” after natural disasters. Most agents do not survive long in the human body after death (with the exception of HIV -which can be up to 6 days) and the source of acute infections is more likely to be the survivors. Human remains only pose health risks in a few special cases requiring specific precautions, such as deaths from cholera or haemorrhagic fevers. Previous Article Stepping up to Manila storm flooding: Shotgun bayanihan! 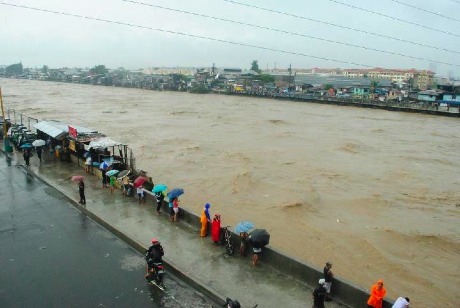 Next Article Could the Php 1.9 bn in flood control projects axed by Noynoy Aquino have saved Metro Manila from destruction?